Medilink staff formed part of the winning Malta Resuscitation Council team at the European Cardiopulmonary Resuscitation (CPR) competition in Freiburg, Germany, at the end of September. The competition was held during the European Resuscitation Council (ERC) Congress, ‘Resuscitation 2017’, which saw some 56 national councils and other interested bodies come together for a CPR praxis and networking event. The Malta team, which included Dr Josef Zahra, Medilink’s Chief Medical Officer and Mark Gauci, a flight nurse with our air ambulance service, won the final against teams from the UK and Germany. Malta Resuscitation Council CPR Team at ERC Congress, 2017. [Medilink personnel: Dr Josef Zahra, Chief Medical Officer (2nd from right); & Mark Gauci, flight nurse (2nd from left). Each national resuscitation council is invited to enter a delegate CPR team. The competition comprises simulated scenarios of patients in peri- / cardiac arrest; this year’s scenarios included the near drowning of a child. International panel experts judge the performance of each team based on multiple criteria including adherence to the established guidelines, appropriate interventions in a timely manner, teamwork, technical and non-technical skills. These are all crucial aspects for an effective resuscitation of a collapsed patient in order to improve the latter’s chances of survival. The teams consist of four to five individuals who are all ALS +/- EPLS instructors. Each team member is assigned a particular role, namely: team leader; airway & ventilation management; cardiac compressions; defibrillation; intravenous access and drug preparation. The team leader co-ordinates the individual roles so as to create a synchronised teamwork. 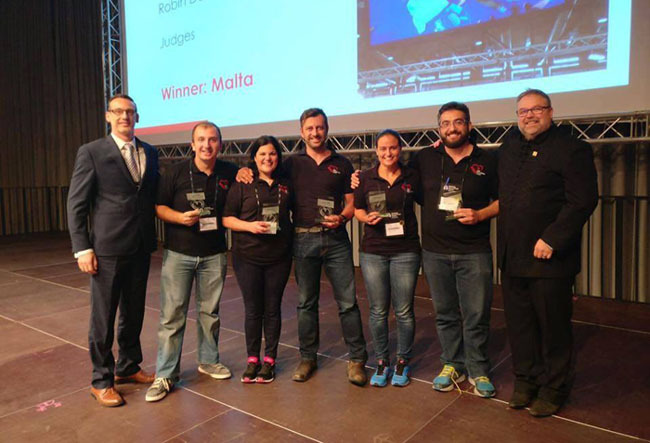 “While all of us on the Malta Resuscitation Council team are active instructors and members of resuscitation teams in our daily work, we challenged ourselves by stepping into different roles and responsibilities for the purposes of the competition. Our thorough preparation and commitment to CPR won the day for us. Mark and I are very privileged to have worked with such dedicated team members,” commented Dr Zahra. Medilink provides medical assistance in various regions of the world, both remote and non-remote. However, one of the most important skill requirements for on-site medics is the ability to provide effective resuscitation and stabilization for emergencies which might occur. It is of utmost importance that our remote medics are up-to-date with the most recent international guidelines for resuscitation. It is only through regular simulated training that the knowledge could be smoothly executed appropriately and effectively during stressful situations, such as cardiac arrests. Medilink’s participation in events such as the ERC CPR Congress and competition is part of our commitment to continual professional development for our staff. The European Resuscitation Council aims to preserve human life by making high-quality resuscitation available to all. Its work covers informal and formal networking and the sharing of data, praxis and science which feed into its wide range of courses and guidelines concerning modern-day CPR. ERC Guidelines are the standard for resuscitation practice and training in and beyond Europe. A network of National Resuscitation Councils, course organisers, course directors and instructors provide resuscitation training for lay rescuers and health professionals. The ERC defines the standard for delivery of high-quality training and certifies providers who successfully complete an ERC course. The ERC annual congress is a chance for national councils to discuss state-of-the-art resuscitation science with international experts as well as review and demonstrate the latest advances in practical CPR training. The ERC has a clear mandate to engage the public under its mission to show that ‘everyone can resuscitate’, given the right training and with increased access to high-quality equipment such as defibrillators. To raise public awareness, the ERC established the annual European Restart a Heart day (16th October) and encourages professionals and public to receive training and to attempt resuscitation if required.